The Memorial Stone at Herbert Park Bowling Club(KBB Shell hole) once stood on the grounds of the City Deep Bowling Club. 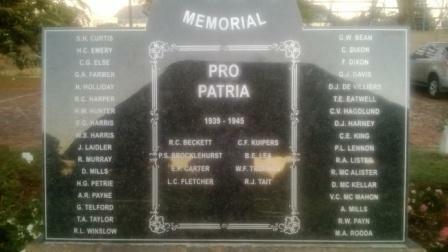 On the closure of the mine in the 1970’s and the subsequent closure of the Bowling Club, the Memorial Stone was destined for the scrap heap. In 1978, living to the motto of “We will Remember Them” a group of dedicated MOTH’s arranged for the memorial to be relocated from City Deep to Herbert Park Bowling Club, where it currently stands today. Thirty odd years of exposure to the elements had taken its toll on the stone resulting in some of the lead lettering working loose. In 2015, the MOTH’s of KBB Shell Hole took it upon themselves to do as their elderly brethren had done and restored to Memorial to its former glory. The monument bears the names of 42 employees of the City Deep Gold Mine who had paid the supreme sacrifice in both world wars.34 men from the Great War of 1914-1918 and 8 men from the Second World War. The only exception to this fact is that one of the men, Daniel Johannes de Villiers, a Commandant with the Zoutpansberg Commando, died 27 November 1914 from wounds received at the Battle of Rooidam in 1900, during the Anglo Boer War. He is also the oldest man, whose name appears on the stone, answering the Sunset Call at the age of 48. The earliest casualty by date was that of Reginald Winslow of the 5th Mounted Rifles (Imperial Light Horse) who was killed in action at the Battle of Grasplatz in the then German South West Africa 25th September 1914.The tragedy of war is brought to the front here as his brother, Wilfred Winslow, from the same unit, was shot dead in the same battle when either he or his brother went to the other’s assistance .They lay buried together in the Luderitz Cemetery. Unlike the above where only one of the brother’s names appears on the stone, the names of two brothers appear on south column. Charles and Frederick Dixon were the sons of Thomas and Priscilla Dixon residing at 96 de Villiers Street, Turffontein. Frederick served with the 4th Regiment of South African Infantry and was 18 years old when he was killed in action in France 2nd March 1917, Charles aged 25, was killed while flying two months short of the end of the war 19th September 1918.Both of their names appear on the Jeppe High School for Boys Roll of Honor.